archival photo – a young DG. yeah, for sure – the week leading into JULY 4th, 2014 – was hot. heavy. humid – intense, loaded. or is fraught with tension, the best way to say it. at least I was just ‘spinning’ out . . in my head. DG aka JASON WULF, 42 – not so lucky. I didn’t cross paths with him, but I’m sure I have many photos of his ‘DG’ street tag in my street art photography archives, going way back to 1985. they were writ large, in large letters all over the place. I always wondered what DG stood for. and I still don’t know. DG = DOG / WULF = WOLF ? 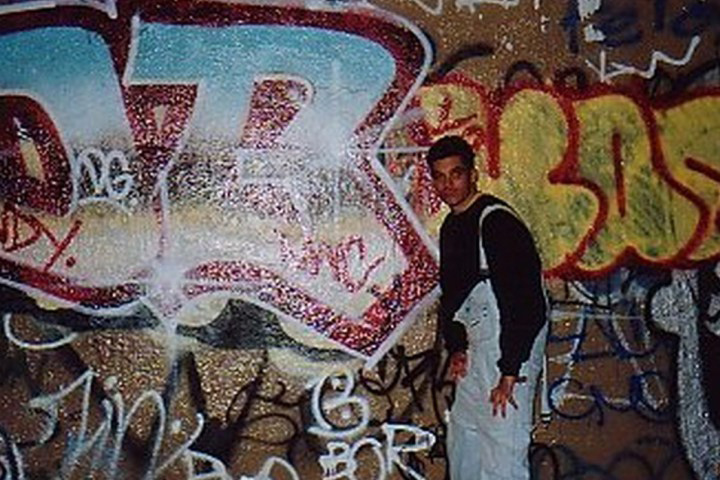 most taggers had more letters that they worked with than just 2. according to the news report – he was the founder of NWC – New Wave Crew. so at least that clears up: NWC. code is code is code. at any rate, sadly, he was electrocuted by the third rail in the 25th St. subway station in Sunset Park, Brooklyn – this past WED, JULY 2, 2014.Brooklyn, in the midst of that week of intense heat that commemorates the War of Independence, and now apparently – that other big attack on NYC. as DG is being hailed as an ‘underground legend’ – and, therefore a ‘warrior’ / a revolutionary of sorts – I think it would fitting to take a moment to reflect that there is underground, as in underground art scene, and there is underground, as in art done way down below the city’s constant hustle, in the underground tunnels and subways. SEAN VEGEZZI of the 15 WARREN & 170 SUFFOLK enterprises – can attest to that, as in: been there, done that. this clip is gorgeous, by all ways & meanings – and is probably the best way to commemorate DG & share his art and the huge contribution ‘underground’ NYC tagging has made to the ‘above-ground’ culture at large – esp re graphic design & font ‘play’. it’s to the Post’s credit that they included the clip link – in their article. when we say, an artist speaks with an ‘authentic’ voice – this is what me mean. when we say an artist works out of his own ‘time’ – this is what we mean. when we say a graffiti tagger / writer – is an ARTIST . . this is what we mean. and so, yeah – please skip the quotation marks around ‘artist’, already. s’il vous plait. it’s bad enough these guys get demonized instead of recognized, you don’t have to question their role as genuine artists, i.e. talent – constantly in the mainstream press. anyway, besides the beautiful grace of the draftsmanship, the visual ‘rhythms’ of these free-form ‘running’ fonts – how they were colored in, and even how in turn the color fields, became just as broken up – and also ‘morphed’ – into say: ‘drips’ – it’s clear in this brief clip – how the ‘art’ form that sprung up from the streets – local kids, with no formal art training – only the city that inspired them – developed. you can watch this – as the clip progresses, and the ‘line’ gets increasingly more complex, and ‘colored-in’ – it’s laid-out simply – like a pure visual narrative, right before your eyes. you can also ‘key’ into the actual visual influence of those subway trains themselves . . racing rapidly by – by the way in which the MOTIONGRAFF filmmakers have integrated actual footage of the subway cars racing by . . so we get, why these guys were so fascinated with the subways – the morph, the flow, the speed – and how, and why their tags – race by too, in a whooosh, but always maintaining that ‘subway’ silhouette, that slight jiggedy-jag, that twists and turns. that comes to a full stop, and then .. takes back off.